One evening, journalist Eric Siblin attended a recital of Johann Sebastian Bach's Cello Suites and began an epic quest that would unravel three centuries of intrigue, politics, and passion. Winner of the Mavis Gallant Prize for Nonfiction and the McAuslan First Book Prize, The Cello Suites weaves together three dramatic narratives: the disappearance of Bach's manuscript in the eighteenth century; Pablo Casals's discovery and popularization of the music in Spain in the late-nineteenth century; and Siblin's infatuation with the suites in the present day. The search led Siblin to Barcelona, where Casals, just thirteen and in possession of his first cello, roamed the backstreets with his father in search of sheet music and found Bach's lost suites tucked in a dark corner of a store. Casals played them every day for twelve years before finally performing them in public. Siblin pursues the mysteries that continue to haunt this music more than 250 years after its composer's death: Why did Bach compose the suites for the cello, then considered a lowly instrument? What happened to the original manuscript? 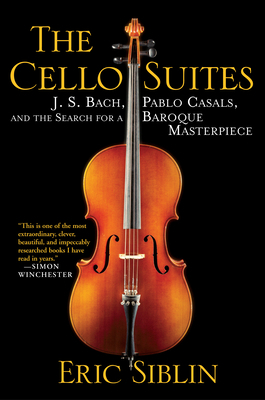 A seamless blend of biography and music history, The Cello Suites is a true-life journey of discovery, fueled by the power of these musical masterpieces. Eric Siblin is an award-winning journalist and filmmaker, and the former pop music critic at the Montreal Gazette. The Cello Suites is his first book.